CogPO is supported by the National Institute of Mental Health (NIMH), Grant 1R01MH084812-01A1. Welcome to the Cognitive Paradigm Ontology (CogPO) Project. The use of alternate and even competitive terminologies can often impede scientific discoveries. While the experimental psychology and cognitive neuroscience literature may refer to certain behavioral paradigms by name (eg. 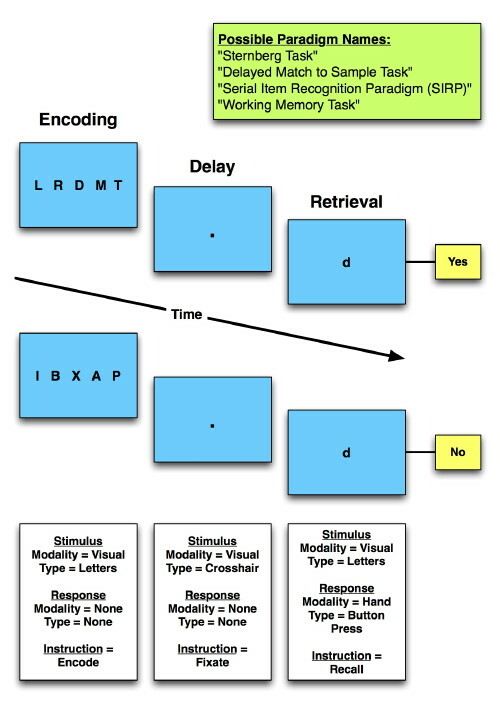 the Stroop paradigm or the Sternberg paradigm) or by function (a working memory task, a visual attention task), these paradigms can vary tremendously in the stimuli that are presented to the subject, the response expected from the subject, and the instructions given to the subject. The figure below demonstrates how the same general task can be given different names by different experimenters. This means that an automated reasoning system using names of paradigms would not realize that data from these different experiments could be compared and used. CogPO was developed directly from the taxonomy created for the BrainMap Database. Its design concentrates on what can be observed directly: categorization of each paradigm in terms of (1) the stimulus presented to the subjects, (2) the requested instructions, and (3) the returned response. All paradigms are essentially composed of these three orthogonal components, and formalizing an ontology around them is a clear and direct approach to describing paradigms. CogPO seeks to represent stimuli, responses, and instructions that define the conditions of the experiment in a standardized format, with well-defined terms and relationships between them. CogPO is being built to be compliant with OBO Foundry principles, and uses the Basic Formal Ontology (BFO) as its upper level ontology. Community and user input is essential to the refinement and application of CogPO. Please contact us to get involved, use CogPO for data annotation, or for reuse of its concepts.